Prices on www.ikuria.com are shown in the British Pounds and include the UK value added tax (20 percent).Payment is taken via PayPal or credit card payments via the Stripe system. Your credit card is charged in the British pound and the latest exchange rate will apply for international customer. Other taxes are not included. Customers outside the EU are responsible for paying other taxes and import duties, which vary from country to country. Please contact local authorities for import tax. If your delivery address is outside the EU, we are happy to reimburse the 20 percent VAT once the payment is made. It will be credited to the same credit card you have used for payment. We do not make any cash reimbursement. There will be no VAT reimbursement for sale items. All of our products are dispatched from London, the United Kingdom. We offer two options for international customers outside the UK; free shipping world-wide via Royal Mail or flat rate £60 for FedEx. Please select upon checkout. For UK customers, we offer free shipping via Royal Mail or courier service depending on the price of the purchased product. We kindly ask UK and international customers to cover shipping costs for both ways should they wish to return products. Please read carefully the Can I Return Products? section below. All the products will be shipped via Royal Mail Special delivery or First Class Signed-For or Malca-Amit/FedEx with tracking numbers. It is very important for you to provide an accurate address. We cannot guarantee you receive products if an wrong address is provided. If nobody is available to receive the product at the specified delivery address and the product is returned to us, we will still charge you the shipping cost and handling fee of 10 percent of the product price. The rest of the money will be reimbursed to your credit card. If you still want to have the product redelivered, we will have to charge the shipping cost for the redelivery but not the handling fee. For U.S. costumers, we recommend the FedEx option if you need your item by a specific date as Royal Mail shipments are treated as "registered mail" in the United States. From our experience, it typically takes 2-3 weeks for the U.S. customs to process a package. For more details about delivery and returns, please read the delivery and returns page. If the products are shown as “made to order”, they are out of stock but you can still place an order. We will contact with you with an estimated delivery time, which is normally between two and six weeks depending on availability of materials. If you are not happy with the waiting period, you can cancel the order. For bespoke orders, please go to our bespoke page. Do you do repairs and resizing after sales? We are happy to repair iKuria jewellery regardless how old they are. Repairs and exchange of parts of jewelleries for £300 or more are free of charge within two months of the physical delivery date. We accept ring resizing after sales. For items sold below £300, resizing costs associated are £20 per item. For this reason, please measure your finger before placing an order. After this period, we will inform you of an approximate cost and time. Once you agree on the cost and time, we will proceed to have your jewellery repaired professionally. For repairs of items cheaper than £299, repair and shipping costs will always be charged. Please contact sales@ikuria.com within 2 days after the delivery if the item is damaged. We will do our best to repair, exchange or refund. However, if the damage is done deliberately, repair works are done at a cost price and we cannot offer an exchange or refund. We regret we do not accept repairs or ring resizing of jewelleries from other brands. We regret we cannot resize rings from other brands. 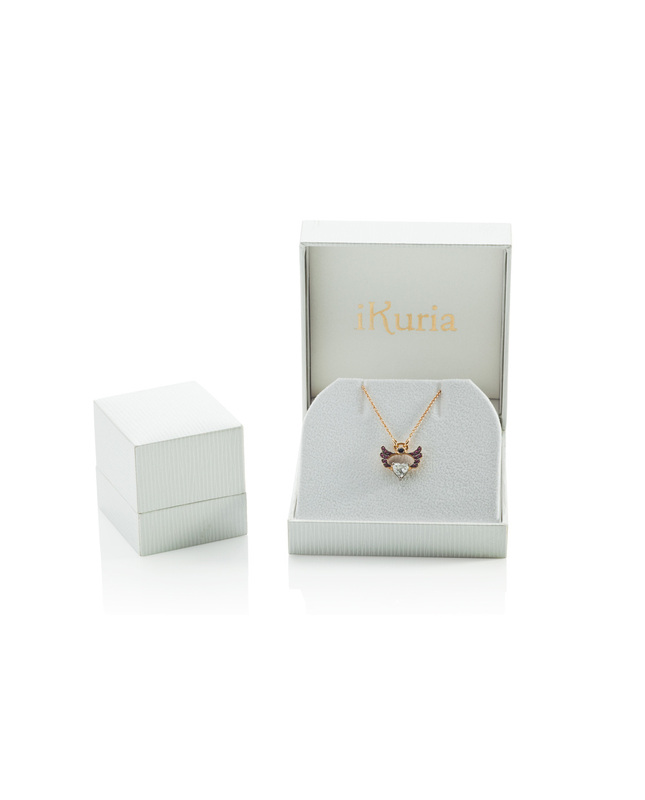 iKuria jewellery will be delivered in our white or champagne colour jewellery box with the gold logo print, which is suitable for a present. For environmental reasons, we try to keep packaging as simple as possible. When you purchase iKuria jewellery at one of our stockists, it may use its own wrapping. How do you ensure the quality of the jewellery? All of our gold jewellery and silver weighing more than certain grammes are hallmarked by the London Assay office.